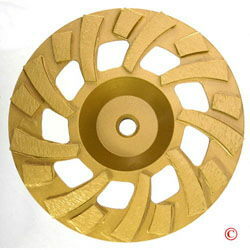 7" Diamond grinding wheel used on hand held grinders with 5/8" threaded shaft. Wheel rental covers non visible wear on wheel, excessive wear will incur additional fees or replacement. * Please call us for any questions on our cup wheel concrete grind 7 inch x 5/8 inch 11 rentals in Portland OR, Gresham OR, Milwaukee OR, and surrounding metro area.